I recently heard from Heidi from Bed Crumb (cutest name!) in the UK and so I have to spread the good word in case you do not know about it already... so sweet! 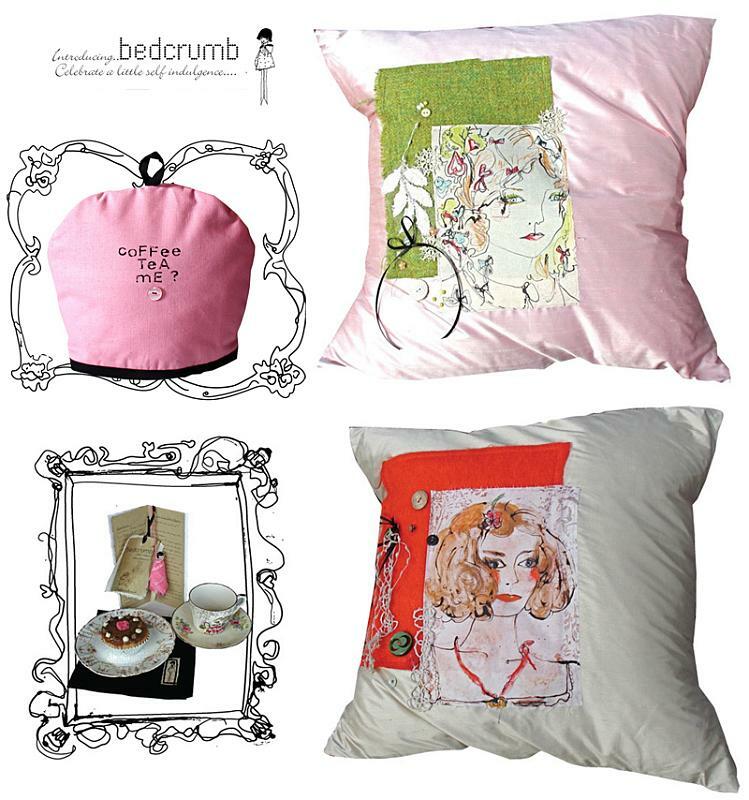 Heidi just launched Bed Crumb, an online shop where she sells exclusive range of home accessories and gifts, her specialty is a cozy range of cushions combining original illustrations and contemporary textile design. It was her experience in commercial fashion and textile design which sparked her interest in following a dream -- to combine her background in the industry with a desire to own a small business where she could exercise her creativity freely, without restraint. This is how Bed Crumb was born. Heidi digitally prints her illustrations onto silk and then adds both vintage and new textiles, trims and other accessories to adorn them, each one-of-a-kind, handmade in her small studio. I absolutely love hearing stories like this because it takes a lot of guts to change the direction in which you've been sailing along, comfortably, for many years. I applaud anyone who does this, I did it and trust me coming from experience, it IS HARD WORK. You think you work hard when you work 'for the man'. Running your own business isn't 40, 50, or even a 60 hour per week dedication, it's a 24/7 dedication because even when you are not working your business and keeping it fresh and afloat is constantly occupying your mind. That is why I say it takes guts because it's not always easy to pursue your passions on paper as it is in your mind, you know how you imagine it to be. When I see people like Heidi who are new in the indie community working hard to promote their business, I cannot feel but a special affection (and admiration) for them. Congratulations Heidi on following your dreams and all the best on your new business. Three words for you Heidi: YOU GO GIRL.